Turn that unused space under your deck into a livable, usable patio with our under deck ceiling panels! We serve Fairfax & all of Northern Virginia. Having an open deck on the upper level of your home can be both aesthetically pleasing and practical, but what about the area under that deck? Many times, that area is closed off or just otherwise not used, making it an unfortunate waste of potential and space. Make the most of your home and let us redesign your under deck area, turning it into a usable, livable space! With the proper under deck ceiling and drainage system in place, you can turn the area underneath your deck into a comfortable, well-lit patio. 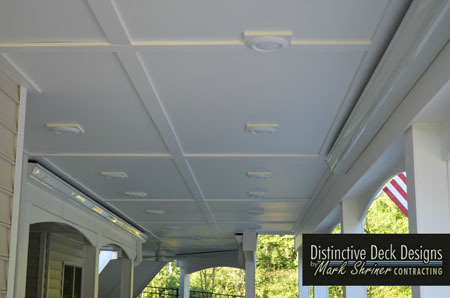 Mark Shriner Contracting, also known as Distinctive Deck Designs, brings more than 20 years of experience in the patio and deck construction industry and has designed and built some of the most beautiful decks in Virginia. Homeowners all over the state, including new homeowners in Woodbridge and Aldie, can enjoy beautiful decks and under decks that are built to last. Under deck conversions are growing ever more popular, as homeowners want to maximize the usable space on their property. Distinctive Deck Designs offers only the highest quality service in Virginia, building beautiful, sturdy decks and comfortable under decks. Our specialized under deck ceiling panels feature flashing, electrical wiring, weather proofing, and a thorough drainage system. All these systems work together to ensure that rain, ice and melting snow will never be a concern for your home’s safety. This underdeck area is now a new expandable dry space for your enjoyment. Proper drainage also protects your deck against invasion by spiders and other unwanted pests that like to set up a home in dark, damp spaces. Integrated lighting also means your under deck area will be usable well after the sun goes down! Mark Shriner and David Tingle form a dynamic team with more than 20 years of experience in professional home building and bring that knowledge and passion to creating the perfect under deck area for your home. Call (703) 263-9634 or contact us online today to get a FREE design consultation!